This was my first visit to Pierre Boulez Saal, a superb, relatively new space for mainly chamber music which opened just over a year ago. Seating an audience of around 680, around 450 less than the Kammermusiksaal at Philharmonie. 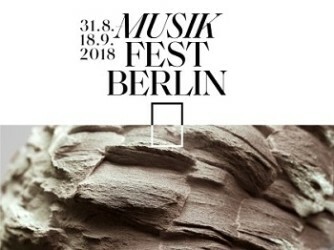 For this afternoon concert with still forty-five minutes to go to the start there was a large queue snaking around the foyer to the ticket office which demonstrates the popularity of both the hall and the high demand for this type of afternoon weekend chamber concert in Berlin. How performers must relish the atmosphere of playing at Pierre Boulez Saal with a packed audience! The three works on this afternoon’s programme chart huge leaps from the Romantic era to the serialism of the Second Viennese School to the most significant composer from the second part of the twentieth century until his death in 2016. First, Webern’s String Quartet, op.28 from 1936-38, an atonal work composed using the twelve-tone technique. Dedicated to its commissioner, Elisabeth Sprague Coolidge, the quartet is the last of his chamber music works. At this time Webern was living near Vienna and following the Anschluss early in 1938 he found his music banned from performance. Webern enjoyed walks in the mountains and it has been suggested more than once that Webern’s music could be a depiction of small details of a flower or a rock rather than the alpine valley of its location. With Webern stretching classical forms to the limit, this was a compelling performance of unerring polish from Michael Barenboim, Yamen Saadi, Yulia Deyneka and Sennu Laine, producing considerable anguish and tension that seemed to reflect perfectly the work’s complex and austere method of construction. Tempering the cool chill of Webern’s string quartet and written almost a century earlier was the early Romantic warmth of Schumann’s three-movement Piano Quintet, op.44. Schumann, the epitome of early-Romanticism wrote works that expressed his poetic and musical sensibilities in a carefree, heart on sleeve manner. Joining the quartet members from the earlier work was pianist Daniel Barenboim (using a Steinway). The artists came together seamlessly to create a moody and stormy romantic ardour with a sensibly judged level of dynamics that felt ideal for the hall’s acoustic. 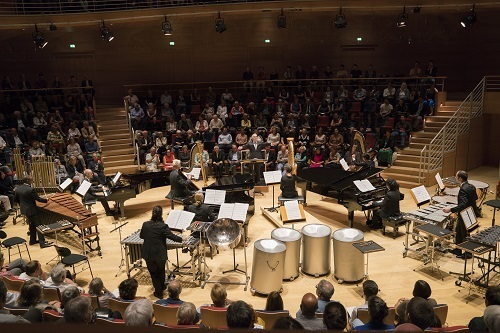 Taking up the second half of the concert was Boulez’s sur Incises, a visually and sonically spectacular work which was on the programme at the inaugural concert of Pierre Boulez Saal in March 2017. Boulez maintained a steadfast belief in the formulaic style of atonal music that initially bought him to general notice and sur Incises, a pivotal work in two parts for nine players, requires an unusual group of instruments: three pianos, three harps, and three percussionists employing a range of tuned percussion instruments – vibraphone, marimba, glockenspiel, steel drums, tubular bells and crotales. The ensemble was conducted by Daniel Barenboim. I’m convinced the rumbustious and energetic sur Incises is the type of work that needs to be seen live rather than experienced on the radio or CD to do it full justice. Watching the players face and overcome the manifold and fascinating challenges that Boulez placed in front of them was some feat and a sight to behold. I loved the way eruptions of sound, often at breakneck speed, transformed into soothing passages all played with such solid technique. With the coordinated interplay between and the timbral possibilities and rhythmic activity of each instrument Barenboim masterfully pulled all the complex strands together. I certainly relished my first concert at Pierre Boulez Saal. In this ideal space for chamber music it was both an acoustic and visual treat; almost theatre.